The links above are to Amazon. "Around Niwot" is also available from the following outlets: Niwot Market in Cottonwood Square, Barbed Wire Books in Longmont, the Longmont Museum gift shop, Walgreen stores in Longmont and Boulder, the Boulder Book Store, and online from Arcadia Publishing. 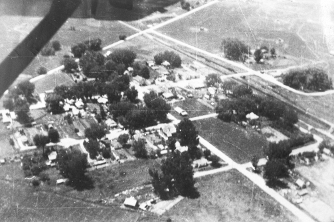 The Niwot Historical Society was formed in 1983 when Don Reeb, then Niwot Community School coordinator, arranged a meeting for those interested in forming a local historical group. Although the initial response was small, those in attendance formed the core group that became the Niwot Historical Society. In 1990, the Historical Society undertook its first major project, purchasing a grave marker for early Niwot builder and businessman John Nelson. Nelson, responsible for the construction of two of the earliest buildings on Second Avenue circa 1910, was buried in Ryssby Cemetery, but his grave had never been properly marked. The buildings established by Nelson still stand as part of the Niwot Historic District, and currently house the Left Hand Valley Grange and Wise Buys Antiques. In 1999, the Historical Society was given the tiny building that once housed the town’s chemical fire cart. Volunteers moved it to its present site next to the Grange Hall, where it now serves as the Firehouse Museum. Outside the Museum, the Society planted a peaceful patio garden for visitors to enjoy. The garden houses a display case with changing exhibits of local historic interest and membership brochures. 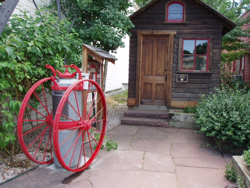 The Firehouse Museum is open to the public only when Niwot celebrates the Fourth of July and other special occasions. Since its incorporation in 2003, the Niwot Historical Society operates under a Board of Directors which oversees its projects and finances. It cooperates with other community organizations – the Niwot Business Association, Left Hand Grange, and the Niwot Community Association – to promote Old Town Niwot as Boulder County's first historic district. Ongoing Historical Society projects today include conducting walking tours of the Niwot historic district, publishing and distributing a newsletter, collecting local historic photographs and artifacts, hosting our " Niwot, Now & Then" lecture series and holding an Annual Meeting. We participate in all seasonal local celebrations and present special exhibits and programs, based on our artifact and photograph collections. We invite you to join us and become involved in our many projects! 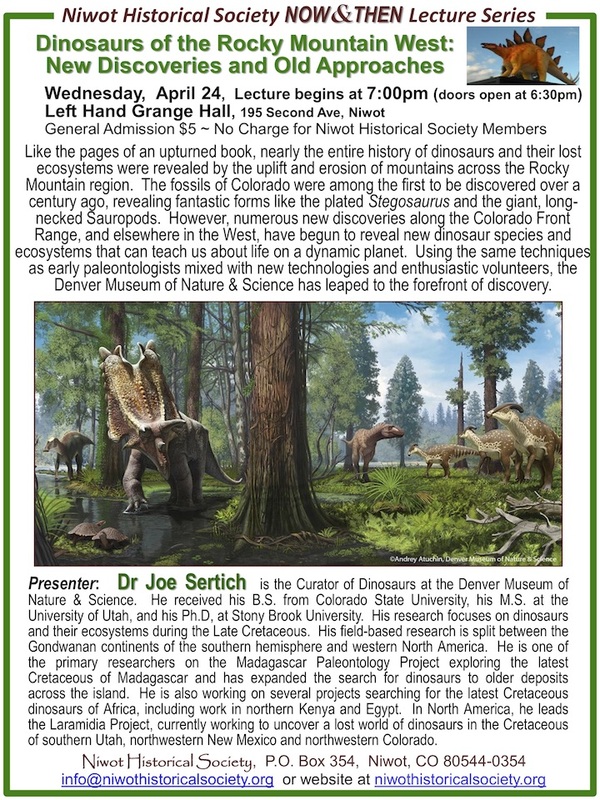 Membership includes free entrance to the " Niwot, Now & Then" lecture series, along with our quarterly newsletter, Niwot Gazette. The Niwot Historical Society’s mission is to preserve, collect, and protect the history of Niwot, the surrounding area, and Chief Niwot through the preservation of artifacts, documents, and photographs relating to their history. The Society encourages the conservation of these resources through publications, programs, and other related activities, and brings people together who are interested in the history of Niwot. Niwot Historical Society is an all-volunteer, non-profit organization qualified under Section 501(c) 3 of the Internal Revenue Code. All donations are tax deductible. © 2012-2017 Niwot Historical Society. Hosting provided by the Rotary Club of Niwot.